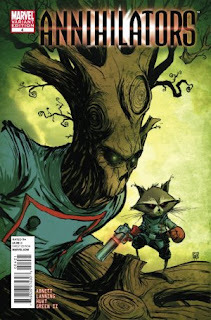 Stewart R: While I occasionally love Marvel to bombard me with a host of great titles in a single week it does come as something of a relief this week to find myself sharing the love sparingly amongst several different publishers including the House of Ideas. This week happens to be one of those times with 7 different publishers or imprints providing me with my weekly haul and what a mixed and varied bag it should be! First things, first then... $1.00 comic book!! There’s a $1.00 comic book out this week!! Yep, Image is treating us with another generously priced debut as Owen Wiseman get’s all Edo Period on our asses with help from Nam Kim, Matthew Dalton and Jessica Kholinne in Samurai’s Blood #1. 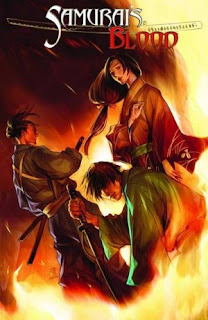 Rather than get stuck into a big historical comic piece about the recognisable names and faces and locations of 17th Century Japan Wiseman has decided to keep this as a very simple and separate story that looks at the lives of three young teenagers, left as the only survivors of a decimated clan who are on the path of discovery to a wider and richer world that may lead them to their desired vengeance and restored honour. I have to say that I do like a good samurai comic every now and then and from the odd interview here and there it certainly looks like Wiseman knows his stuff in terms of the era and setting as well as getting the most from close and personal character work. For a single dollar (what’s that, 80p in the UK) this has got to be worth a punt this week. Certainly worth a punt last month was Archie Comics’ adaptation of arguably Capcom’s most popular video game character and Mega Man #2 will hopefully continue the terrific retro-vibe from the first issue. It was refreshing to see Ian Flynn taking the original back story from the mid-eighties game and just flesh it out slightly here and there to make the transfer to comic medium as comfortable as possible. The thing that has really stuck with me this past month and made me look forward to the second instalment has been Patrick ‘Spaz’ Spaziante’s brilliant visuals which perfectly captured the futuristic, robot-populated world that Rock, Doctor Light and Roll live in. I imagine this issue is likely to contain a fair amount more action than last month so I’m expecting I may have to polish my eyeballs especially for the colourful bounty to come. Speaking of visuals and artists, this week signals the arrival of Sean Murphy to the vampire-filled world that Scott Snyder created as the American Vampire: Survival Of The Fittest mini-series kicks off with #1! 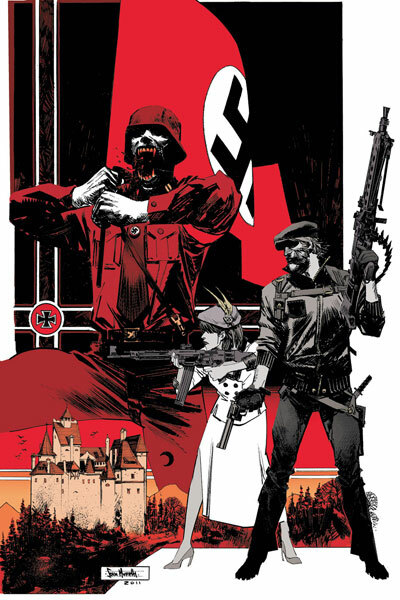 I certainly know a couple of the Paradox Comics Group who have got plenty of time for the American Vampire world having not been too keen to begin with but now wouldn’t think about missing a single issue or associated series - it’s almost as if they were bitten and transformed by the comics themselves! Snyder’s writing has been quite sensational with the main series and the fact that Joe The Barbarian artist Sean Murphy is onboard here to help tell the spinoff tale of two vampire hunters going behind enemy lines in Nazi-occupied Romania during World War II secures this firmly in my pull-list for the entire 5 issue run. While one 5-parter begins this week, so another ends and 12-Gauge Comics’ Magus #5 is set to wrap up this story of a modern world transformed into a realm of terrible instability thanks to a global release of everybody’s natural magic abilities. I think the main idea running through this series is really interesting and I’ll admit now that I have been wondering through the past four issues if such a broad and big concept has been addressed quite as well as perhaps it could have been. Certainly Jon Price’s character development has been coming on leaps and bounds in the last couple of issues and Rebekah Isaacs' art has been accomplished but I can’t help feel that once I get through the 22 pages coming at me today it’ll seem like this series could have been expanded over a length at least double to what we’ve had. That of course is assuming a lot about these unknown 22 pages and so I wait for whatever surprises lie in store in this finale. Seems a shame to get through an episode of Incoming... without covering at least one title from the big two publishers and so I’ll nod my head in the direction of Abnett and Lanning’s Annihilators #4 which bring to an end their run of bumper efforts in the Space-based Universe. The main Annihilators story has been somewhat underwhelming - I’m unfortunately looking at the art department to carry that one on their shoulders - but the Rocket Raccoon and Groot backup has been a reasonable success and I really am excited to see where DnA leave the mammal with a penchant for munitions following some neat revelations about his past. If Bleeding Cool’s rumours are to be believed it appears that these writers may be working on a DC title as part of the newly announced relaunch and if that’s the case it means that their exclusivity to Marvel is at an end and could signal a lull in stories from or, *gulp* a reboot of Marvel’s cosmic line at some point in the near future. I was dominated by Flashpoint pretty much, having purchased last weeks Batman Knight Of Vengeance & Deathstroke & the curse of the ravager. This weekend when I head up into town I mean to get Emperor Aquaman and Journey Into Mystery. It seems that you and I are at different ends of the scale when it comes to these events Joe T as I was left disappointed by Blackest Night at the very end and bored by Brightest Day. I know Flashpoint may end up proving pivotal to the upcoming relaunch spectacular but I think I'll just wing it for the time being and get it in TPB if it seems to be essential reading. I do agree that Fear Itself hasn't turned out to be as good as was promised but I'm expecting Matt Fraction to flip the table over at any second and a whole herd of plot reveals and details to go scurrying everywhere. If it doesn't happen at the halfway stage then Marvel really has dropped the ball on this one. I think it’s important to remember that Annihilators wasn’t a cosmic adventure on the scale of Operation Galactic Storm or The Annihilation Wave which involved multiple galactic empires and heavy hitters like Galactus. I think # 1 and # 2 were the strongest issues although they managed to have some pretty interesting surprises through out. I think this issue will get a luke warm reception. I thought it wasn’t too bad but of course it didn’t have everything I wanted to see. @Stewart, I really enjoyed the core Blackest Night title, and the Green Lantern tie in(which was more part of the actual story than simply a tie in) and the Blackest Night Flash mini. The main Brightest Day title I just couldn't get in to, and I dropped it with issue 3, I got the first 7 issues of The Flash before dropping,and a couple of issues of GL Emerald Warriors and GLCorps,meaning the only one I stuck with was Green Lantern. I'm not the biggest fan of events in all honesty, though I think DC have a much better handle on them than Marvel do, and I say this as a major Marvel fan.